Stay in the heart of the Beaufort Historic District and explore the antebellum homes, plantations, and secluded islands of South Carolina’s Low Country at our charming hotel on the Beaufort River. Walk to quaint shops, art galleries, book stores, and a variety of cafés, bistros, coffee shops, and eateries. The Beaufort Inn, located in the heart of Beaufort’s Landmark Historic District. The Beaufort Inn’s historic architecture, curved balconies, verandas and gardens capture the essence of a gracious southern coastal town. Let our Beaufort South Carolina hotel exceed your expectations. Beaufort hotels, inns and motels offer exceptional accommodations for travelers from across the country and around the world. Discover a wide range of lodging options in the Beaufort area, from charming inns to luxury hotels. 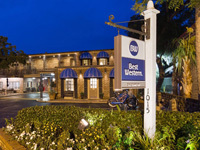 Whether you’re visiting Beaufort for business or pleasure, you’ll find the perfect place to stay.